This is the PreSonus StudioLive 32SC, A 32-channel powerhouse packed inside a portable, rack-mountable frame. The StudioLive 32SC is a compact digital mixer that can compete with its bigger brothers, particularly when you consider its price, and thanks to AVB, it’s easily expandable. You can network the 32SC with EarMix 16M personal monitor mixers for customized onstage mixes and PreSonus NSB-series stage boxes for additional inputs. The 32SC’s 16 FlexMixes can be individually configured to function as aux buses, subgroups, or matrix mixe; your routing options will border on limitless. The Fat Channel processing section employs expandable, plug-in options with vintage-style EQ and classic compression options on every input channel and output bus. The 32SC also ships with PreSonus Capture® recording software, which can be run directly on your mixer or Windows or Mac computer. Record all 32 channels plus a stereo mix of your choosing via USB, to an SD Card, or both for the ultimate redundant live recording rig. Few designs in high-tech musical equipment manufacture have had as enduring a presence as Presonus’ StudioLive mixers. Few designs in high-tech musical equipment manufacture have had as enduring a presence as Presonus’ StudioLive mixers. Since their introduction in 2009 with a FireWire interface built in along with a rich bundled software suite, every new iteration of its design is anticipated and thus far, universally praised. The introduction of the 2019 version has the industry’s attention. It should have yours too.Since their introduction in 2009 with a FireWire interface built in along with a rich bundled software suite, every new iteration of its design is anticipated and thus far, universally praised. The introduction of the 2019 version has the industry’s attention. It should have yours too. The 32-channel StudioLive 32SC packs large-format digital mixer power into the smallest compact chassis possible. Pound for pound, it’s the best digital mixer available for building your dream studio or putting together a pro touring rig for your band. 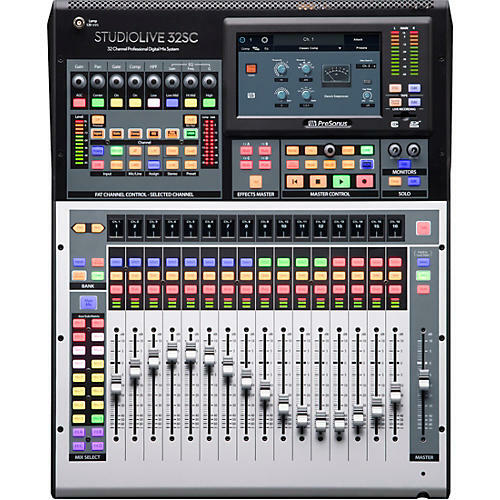 Powered by the dual-core PreSonus FLEX DSP Engine, The StudioLive 32SC is loaded with 40 mixing channels, 26 buses, and 286 individual processors. Unique features include: unmatched 128-channel (64x64) USB recording; onboard multitrack SD Card recording with true virtual soundcheck; expandable, Fat Channel plug-ins with studio-quality, vintage EQ and classic compression options on every channel and mix; 16 FlexMixes individually configurable as Aux, Subgroup, or Matrix mixes; 17 touch-sensitive, motorized faders; and a comprehensive software package, including PreSonus’ Studio One® Artist DAW and Capture™ live-recording software.